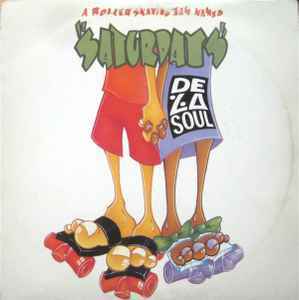 De La Soul ‎– A Roller Skating Jam Named "Saturdays"
Artwork [Cover Illustration] – Joseph Buckingham Jr.
Also released as a promo with the same catalog number. The Mighty Ryeders' "Evil Vibrations." Chicago's "Saturday In The Park." Young-Holt Unlimited's "Light My Fire." Another mediocre bunch of remixes. I like Morales but De La Soul is not a house band. The B side remixes just don't flow with a hip-hop track -- when will these people ever learn? The only good version as usual is the LP version which is usually the case in Hip-Hop 12" releases. They should have included the instrumental of the LP version instead of 40+ minutes of junk. Anyway the scratching on the LP version is crazy good. One of the best heavy sampled tunes from De La Soul. Even though De La Soul "Roller Skating Jam" lists with many of their Hip Hop undeniable mega-hits, I would like to point out David Morales legendary remixes. From the view point of house music they are priceless gems and by those I mean 6:00AM Mix and Mo Mo Dub, which are strip down versions of original track that are pushed in totally different direction. This was the sign in 1990 for what is yet to come from the genius mind of Mr. Morales. It is deep house music as it always should have been: simple, profound and with hard hitting piano synth. Wariust the original is on there it's the LP version ! I am wondering; why do most of these releases only contain mediocre to wack remixes of this top notch track, and not the original? It doesn't make sense.